Paper Crafts by Candace: Game of Thrones Mini Blog Hop Season Premier! I went to Ireland last year and saw the Castle that is used for the House of Greyjoy. So for my project today I decided to do a digital layout. you will get the Game of thrones title SVG by doing this hop. Love this hop for my favorite show! Love the layout! Beautiful! Love seeing scrappage layouts as well. Wow! Can I say, LUCKY!!! Wow, love your layout. That castle is awesome! Lovely layout! I'm planning on making another trip into Ireland soon - will have to visit here! Wow! How awesome was it that you got to go to Ireland and actually visit the castle. Think I'm insanely jealous. Of course, this spectacular hop would not be complete without the title. What a lovely layout . Sweet layout, so jelly you went abroad! Great page layout! A wonderful memory for you. That must have been cool to wander around that beautiful castle! It also looks COLD! Great layout. Thanks for the files! Looks like it was an amazing trip, the page is beautiful. Nice pictures and pretty way to display them. This layout is awesome, totally love how it looks, nice job Candace!! Wow! That's just beautiful. Love your layout. beautiful layout and cool pictures! Amazing. I've always wanted to visit. Your layout is wonderful. Your scrapbook layout is awesome. The title makes the page pop! I don't scapbook, but you're layout is wonderful and your pictures are beautiful. Oh I love this. Perfect for a scrapbooker like me. Now that is cool! Thanks for the hop! Wow - beautiful pictures and a great layout! Love this layout. Great project. That is awesome you got to see the castle they used. At first glance I would not have geussed the layout was digital. It turned out great. Your LO is AWESOME!!!! What great pictures and the title is perfect!!! Great LO!!! Thanks for sharing! beautiful place and awesome LO!!!! You lucky girl!! I love your layout and that title is fabulous!! Wow, what a beautiful layout. It could not have been any more perfect for your DT challenge. Wow! That is so cool! Visiting Ireland AND the layout. And you went digital with your project! :) Fabulous hop ladies! Great hop Thank you so much for doing this. So cool that you saw the actual castle! The layout is beautiful. Wow, the pictures are so awesome! Love your layout! aren't you lucky to have gone to Ireland!! Love your layout!! That must have been a very cool vacation. Would love to visit Ireland. Great layout. And such jealousy over your trip, must have been wonderful. The title is just perfect for these pictures, lovely layout. Lucky you! Great layout! What an awesome experience! Awesome projects you all did fabulous! that is so cool. Great layout. I enjoy Scrapbooking and your layout is terrific. Your title placement is great. Thanks. a pretty layout. Could be used by non GOT fans who have visited Ireland or have Irish ancestry, would just need a little modification. great job. What a beautiful LO!! And the castle is amazing I can't even imagine what it looks like in person! I so want to go there someday. Love the layout. Hubby is of Irish decent so hope to see this one day soon as well. Great pics. Thanks for sharing them. Love the title. Great layout. This will make a terrific t-shirt with vinyl. OMG, your so lucky, I've always wanted to go to Ireland. Your photos are stunning & your layout is down right cool as all heck. I would love the see the castle in real life. Thank you for sharing. I am so jealous I would love to go to Ireland. This Beautiful!!! wow this was a great layout and great hop!! I've been there before. Very nice layout! wow that is awesome that you were able to see the castle! tfs! I love this scrapbook page!! Oh My Goodness. I am so Jelly!!! 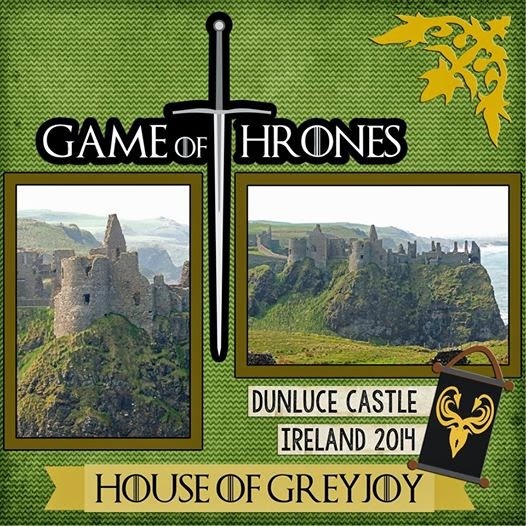 One you got to go to Ireland and Two you got to see this castle they used for the House of Greyjoy. Totally awesome, just like your layout. Love the page, very nice! I have to say, I am a bit jealous! Your layout is amazing. Thanks for sharing. Great project and an awesome hop! Turning (envy) greener by the minute - great LO! Love your layout! Awesome colors. Fabulous layout! Love your pictures!!! love the layout! looks great! Lovely layout - have you done the WHOLE game of thrones tour? So jealous... would love to visit Ireland. Great layout! Wow! Your layout is perfect! That is just awesome! Your layout is amazing!!! how cool, that you got to visit this castle! Thanks for sharing that! Love GOT. Super cool! Jealous of your trip! I am sure you had an amazing time filled with scrapworthy moments! wowwwwww que trabajo tan lindo !!! Love the layout! Thanks for sharing!! You are a very lucky person. It looks amazing.